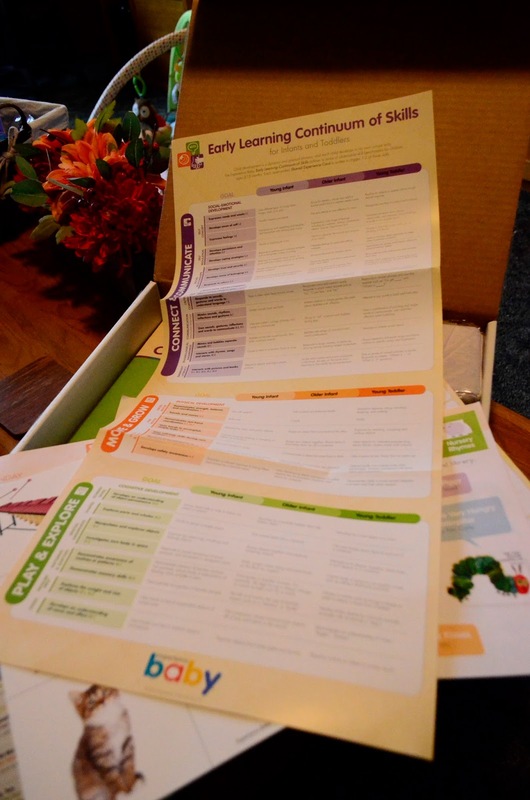 Why do you need an infant curriculum? Mother Goose Time from Experience Early Learning is always trying to top themselves. They saw a need for an infant curriculum and they filled that need. Experience Baby is a relationship based model which provides experiences to support learning and development. Now you might think, infant curriculum, really? But let me assure you, there are no worksheets, no tests. At it's chore, the Experience Baby curriculum is a guided walk through infant development. I have three children. With child number one, I had no idea what he was capable of at an early age. I would often show up at the doctor's office for his routine check ups and they would ask me developmental marker questions. I would often answer, well no, he hasn't done that. It wasn't because he couldn't do those things, but because I had not offered those things to him. I would walk away thinking, I didn't know he could do those things. On the flip side, he started walking at 10 months, so obviously he was well ahead on some development too. Three kids later and 5 years of Mother Goose Time use, which is also, in my opinion, Early Childhood Education training, and I am much better at knowing what an infant, toddler and preschooler are capable of. Now let me reassure you, my poor first son, Lachlan is incredibly smart, and such a kind and loving boy. I just sometimes wish I had known more. That's why I think that Experience Baby would be a spectacular baby shower gift for a first time Mom, but really for any Mom with an infant on the way. Experience Early Learning put together a video of everything included in the Experience Baby curriculum, and it's really the best way to see and understand it all. I was able get a hold of a box for my dear friend Dana, whose little one was born on January 10th. The Experience Baby curriculum is for infants 3 months to 18 months and she will be 3 months so soon. 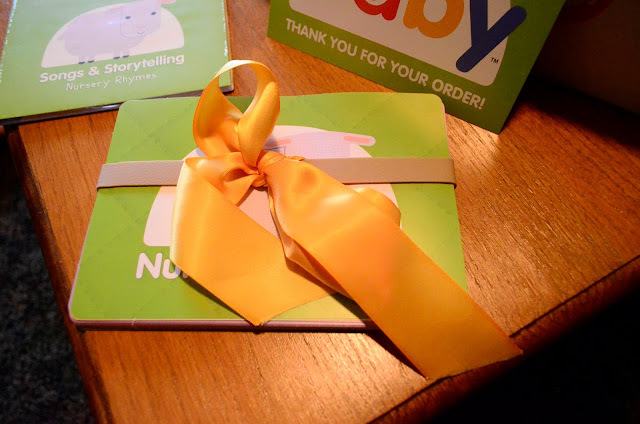 She received the Nursery Rhyme Experience Baby box and I was able to take a few pictures. This is how the box arrives, it's adorable of course. The Teacher Bundle comes in a canvas bag. Inside the Teacher Bundle you will receive a music CD with word plays, instrumental songs, nursery rhyme, folktales and lullaby songs that go along with the monthly theme. You also get these Shared Experience Cards, 36 each month. They are color coded according to the experiences they provide. Purple is for Connect & Communicate, green is for Play & Explore and orange is for Move & Grow. When you flip them over they give recommendations on how to connect with the three different age groups. Young Infant is considered 3 months to 6 months, Older Infant is from 6 months to 12 months and Young Toddler is from 12 months to 18 months. 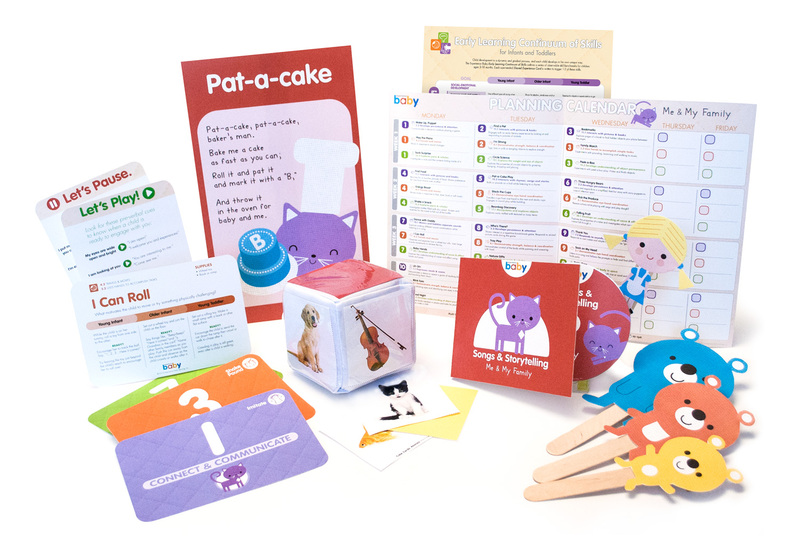 Each of these cards are designed to guide an infant in developing in a specific skill. That skill is shown in the top left corner. First you see a small square graphic indicating the skill and then numbers. This card says 2.2 and 10.2. You can look up those numbers on the Early Learning Continuum of Skills which you can see below. This continuum comes as part of the Teacher Bundle and I think it's the crown jewel of this box. It has a description of what a child should be able to do in regards to that skill at the three different levels. So if your infant is 3 months, you can look under the Young Infant column, see what they should be doing at this stage, in this skill, and know pretty quickly if you are on track. There are many reasons you may want to know this, just simply for your comfort and relief. But the most important reason to know where your infant falls on this continuum is so that you can find out what comes next. It's called scaffolding, which sounds fancy, but all that means is if you know where they are now with a skill and you know what comes next, you can work on slowly and incrementally guiding them to that next level. Simple. And the Shared Experience Cards will help you do it. 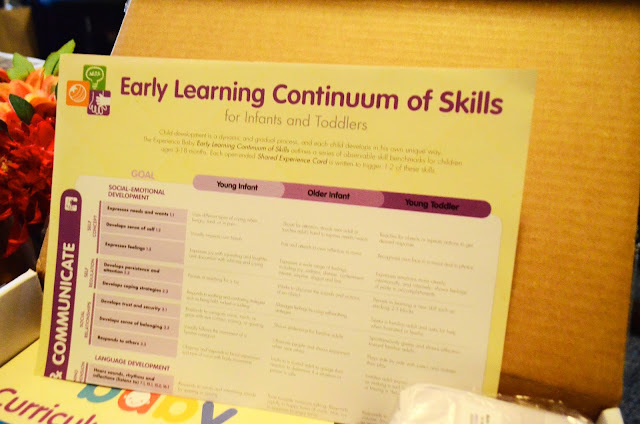 You can see the Early Learning Continuum of Skills a lot more clearly in this PDF. Also included in the monthly Teacher Bundle is the Planning Calendar which is a mapped out guide of how to use all the cards each month. You also get a new pocket cube each month and cube cards to insert in the pockets. The next part of the curriculum is the Baby Bundle. This part includes the Travel Journal which I sadly did not get a picture of. This journal has a place to mark down details about diaper changes, feeding, nap times and length and a place to write in what Experience Cards were accomplished that day. You will have to watch the video to see it for yourselves. But this is where the Experience Baby curriculum becomes the perfect gift for a new Mom who will be returning to work. If you are staying at home with your infant you can use all these tools yourself, if you are going back to work, you can bring this kit to your infant care provider, if they aren't using it already. If you don't want to bring the whole kit, because you want to use the cards at home, you can at minimum bring them the travel journal so that you can have all that information documented in one place. My friend Dana, may try to find a nanny to care for her daughter when she returns to work. So her kit can stay at her home and be used by the nanny to guide her daughter through development and the travel journal can be used to keep Dana informed. 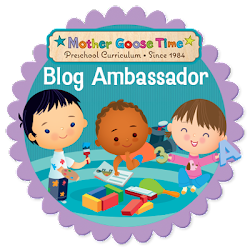 If you want to read more Mother Goose Time wrote a quick tour post on their blog which you can check out here. If having this knowledge and step by step guide through infant development sounds amazing to you, like it does to me, get yourself a box. If you have a little one, buy one for yourself. If not get one for a friend who is soon to have a baby in their lives. This would make a spectacular and unique baby shower gift. 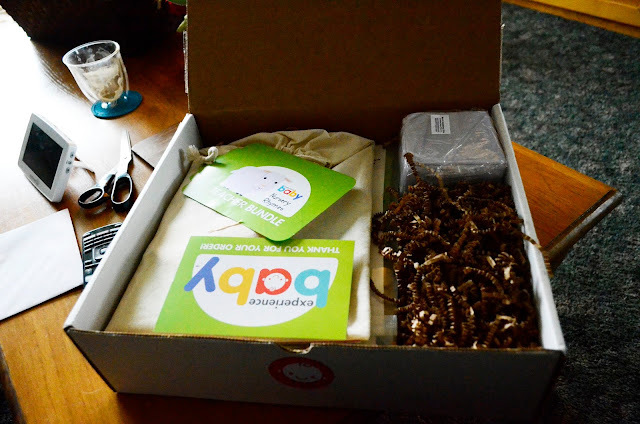 You can also subscribe if you want a new box coming each month. I get no commission for saying this. I am just passionate about it. The knowledge and experiences you receive with this kit are priceless, so much more valuable than anything else you could buy.